Human hair, fiberglass, steel, Persian lamb, acrylic paint, beads, upholstery sewing needle, waxed linen. In the recesses of the collective unconscious, there is a vague historical memory of a furry fish. In the time of circus sideshow dime museums, one could expect to find such a rare beast on display, carefully crafted by a clever backwoods taxidermist interested in fabricating folklore. Such hoaxes or unnatural curiosities were commonplace as Canada was still establishing itself as a country, although the tradition of mythical beasts is universal and goes back much further. The furry fish, also known as the hairy trout, beaver trout, sable trout, etc is a fictitious monstrosity, said to have evolved fur over its scales in order to protect it from a cold, northern climate. 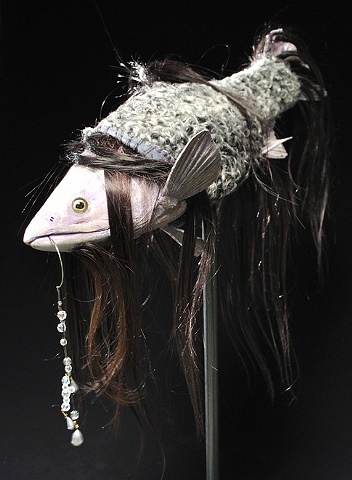 No such fish exists for real in any place on earth, but faux taxidermy examples still exist, in places such as Ripley’s Believe It or Not museums. In fact, up until the 1930s, one such creature existed on display in the Scottish National Museum as an authentic example of an odd Canadian species of fish, purportedly captured by a fisherman from Gaspé. It was my intention to recall such a myth in my creation of my salmon, pretend-native to New Brunswick waters. My made-up Latin taxonomic categories of ‘Salmonidae hispidus’ lend legitimacy to the imaginary sea/river freak. A ‘hispid’ animal is one that features naturally occurring coarse hair. I worked to produce a pseudo-replica of a taxidermist’s hoax, using the salmon form provided, and covering its body in a furry coat of Persian lamb and human hair.